Merck KGaA and Pfizer’s late entrant to the checkpoint inhibitor category has failed a phase III trial in ovarian cancer, denting their hopes of building momentum for the product. The JAVELIN Ovarian 200 study was testing Bavencio (avelumab) alone or in combination with chemotherapy (pegylated doxorubicin) in patients with resistant or refractory ovarian cancer, but who showed that the PD-L1 inhibitor wasn’t able to improve either progression-free survival or overall survival. 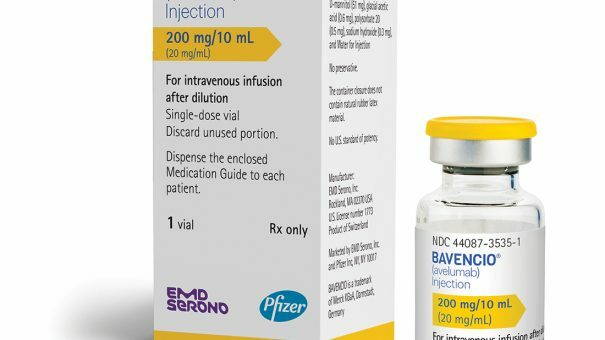 It’s the latest major trial in a solid tumour to end in failure for Bavencio, after it missed the mark in second-line non-small cell lung cancer (NSCLC) in February and a third-line advanced stomach cancer treatment towards the end of last year. And while the company was quick to point out that the patient population is a challenging one to treat, a third study miss is starting to make investors nervous. The study “enrolled a high proportion of patients with aggressive, refractory disease that had no response to prior platinum-based chemotherapy, a population…typically not included in Phase III ovarian cancer trials,” said Pfizer’s head of immuno-oncology Chris Boshoff. There’s a desperate need for new treatment options in patients on resistant or refractory drugs, and the trials results “speak to the significant challenges these women face,” he added. Bavencio was first approved last year for Merkel cell carcinoma, and added a second indication in bladder carcinoma (urothelial carcinoma) shortly afterwards. It needs to add new uses to its label if it is ever to make any significant inroads into the market share currently held by other checkpoint inhibitors like Merck & Co’s Keytruda (pembrolizumab) and Bristol-Myers Squibb’s Opdivo (nivolumab). Merck recorded just €19 million in Bavencio sales in the third quarter, a tiny fraction of the $1.9 billion and $1.8 billion respectively for Keytruda and Opdivo in the same period. There has been positive news as well, including solid results in first-line kidney cancer (renal cell carcinoma) for Bavencio in combination with Pfizer’s tyrosine kinase inhibitor Inlyta (axitinib), and there is additional data due in first-line ovarian – from one study in combination with chemo and another in combination with a PARP inhibitor – as well as in first-line NSCLC next year. Merck and Pfizer also have first-line maintenance studies ongoing in gastric, ovarian and bladder cancer.